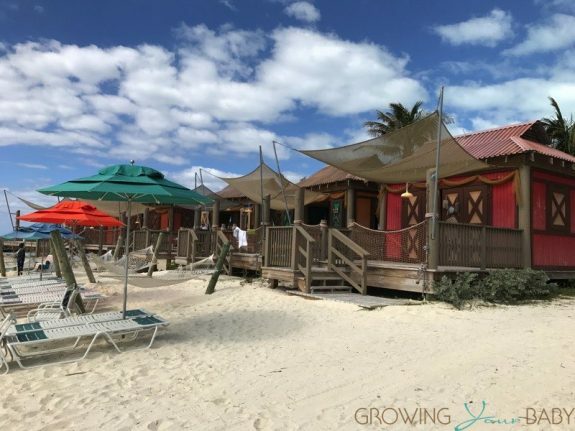 10 Reasons We'd Love To Be Forgotten On Castaway Cay! 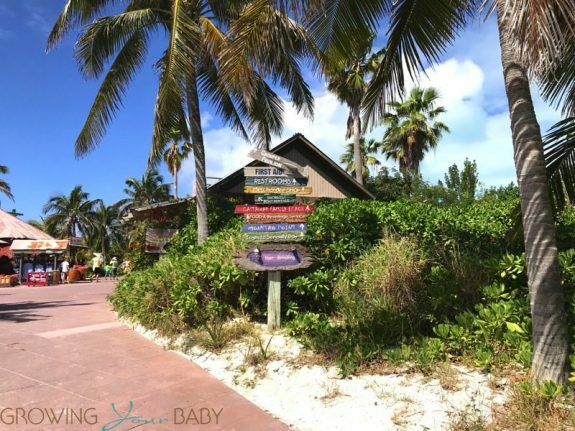 Home » 10 Reasons We’d Love To Be Forgotten On Castaway Cay! 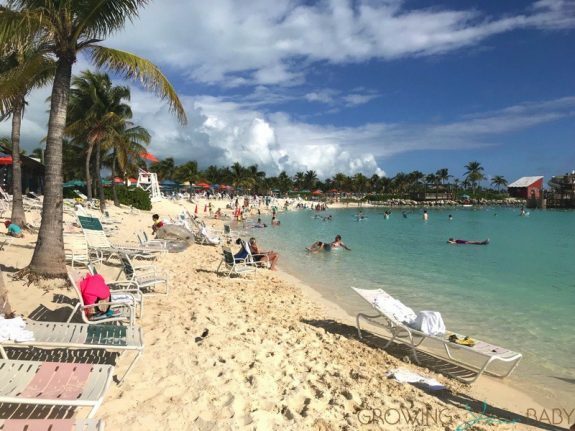 Castaway Cay is the perfect island because it offers something for vacationers of all ages. Divided into different areas, there are so many activities to do you can visit often and not see or do it all. I love the beauty of the Caribbean but hate the hustle of having to find a cab, research the perfect beach and then barter to get there and back. On the beach you often encounter people trying to sell goods or services and it can turn a relaxing day into a stressful one. 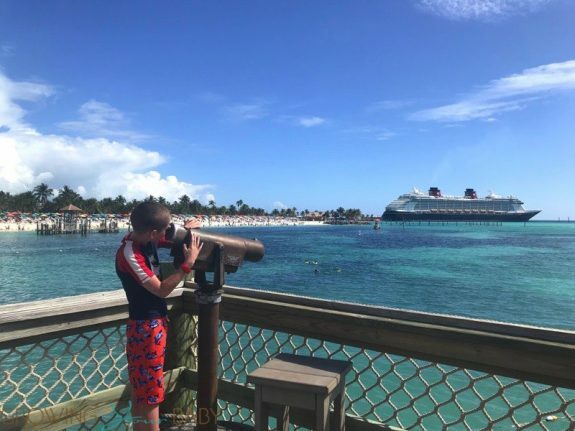 Visiting Disney’s Castaway Cay is like a dream. Just a short walk from the ship you can park you crew and swim until your heart’s content. Want to do nothing? They have that. Want to see it all? You can do that too. Everything is so close and it’s all easy to do. No peddlers or extra fees – just put your feet up and enjoy! 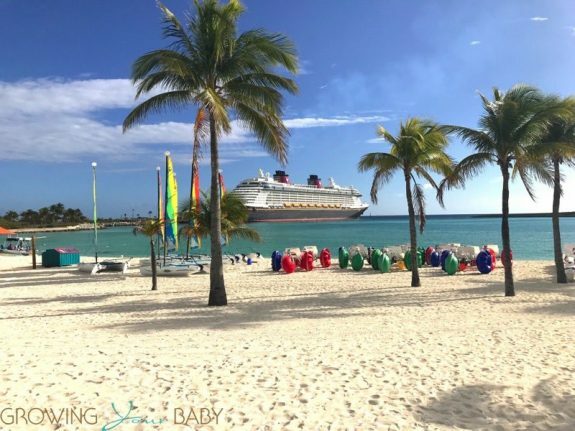 My problem with Castaway Cay is it’s a place you’d love to spend a few days not a few hours… So here are the 10 Reasons I’d love to be forgotten there! 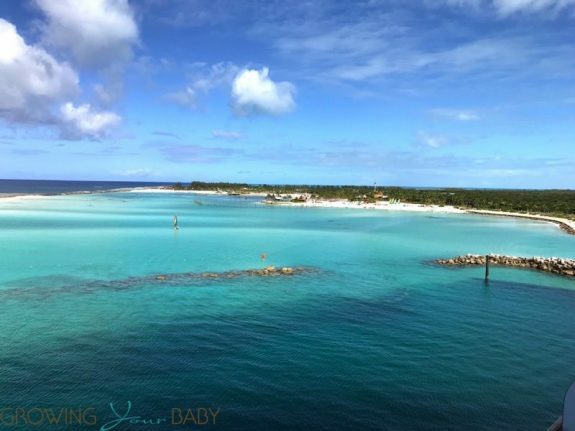 The islands of the Bahamas are famous for their incredibly perfect beaches and Castaway Cay is no different. 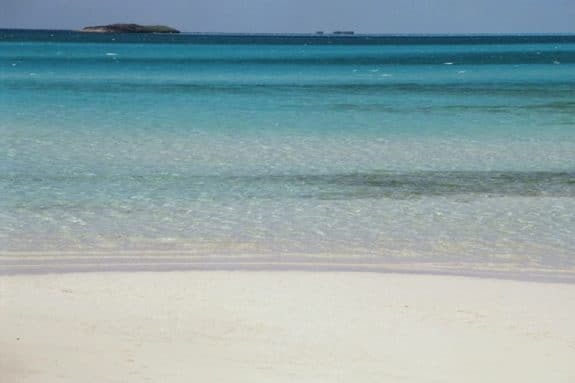 With soft, powdery white sand that makes the ocean glisten, the beach here is a shade of turquoise your heart dreams of. The water is a bit cold in February but I didn’t care. It was -10 and snowing back at home so I enjoyed a long, relaxing swim. The beach also goes on and on and on. With layers and layers of chairs so no one is left out. Bonus? There is no cost for rent the loungers OR umbrellas! 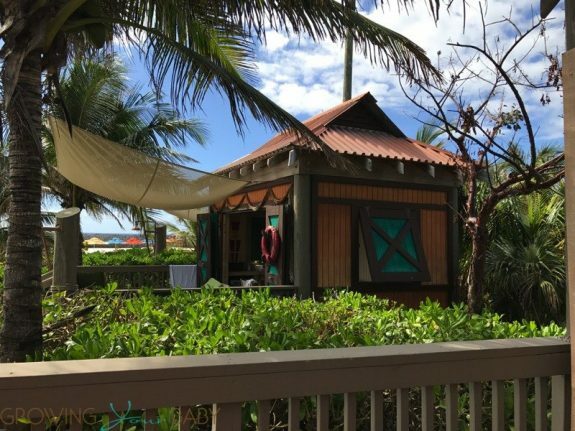 If you’re looking to enjoy a day on your own private piece of paradise the cabanas are the way to go! 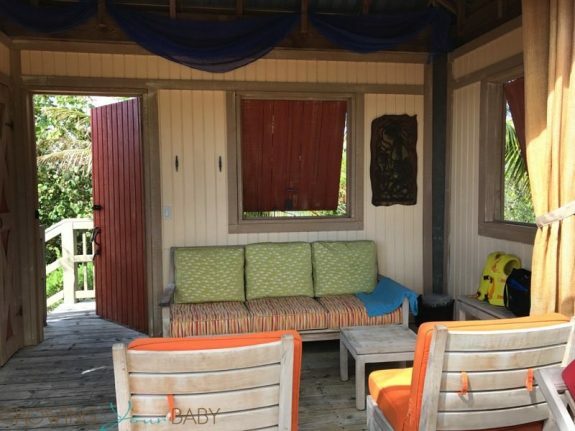 Your own personal cabin for the day, the cabana area of the island is only accessible to guests who have reserved them. Each unit comes with an indoor and outdoor seating area, safe for personal items, stocked bar fridge, sunscreen, beach toys and towels. If you get hungry there is also a snack basket with chips, cookies and granola bars. Serene, you have your own slice of the beach with a hammock and more chairs closer to the water for lounging. If that’s not enough a cabana host is at the ready for guests who would like something from the bar. The Pelican Plunge is a water haven set in the middle of the lagoon. 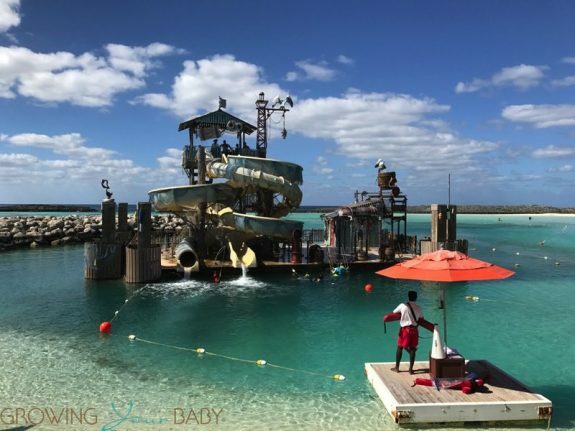 The only way on to the ‘island’ is to swim out but once there you may get soaked by the enormous bucket filling up on the dock or you can choose to go down one of the two water slides – one open and one covered. My kids love this area. The swim out is cold but they don’t care. They make the trek over and over to whip down the slide and fly into the ocean. Located on the other side of the island, this adults only(18+) paradise was designed for one purpose – relaxation. Whether you are traveling as a couple or you have made other arrangements for your kids, Serenity Bay is the place to press pause and unwind. Located beyond the first set of Cabanas, adults can access the beach on foot or via a tram that runs all day. The Bay itself is calm and pristine with an adults only BBQ area and servers who walk the beach ready to bring beverages to happy parents. There is no denying that Disney is a very kid friendly cruise line but having this area for adults to recharge is brilliant. 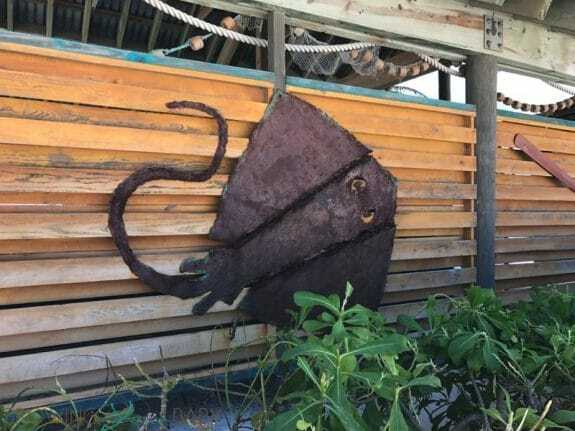 My family has a small obsession with stingrays and Castaway Cay has a port adventure that allows guests to interact and feed these beautiful fish. 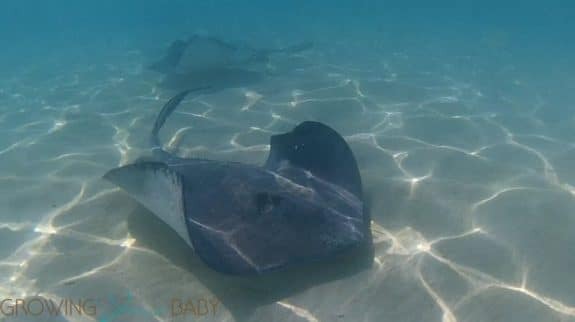 The excursion begins with an educational session where guests learn more about the different kinds of stingrays, and the difference between males and females. 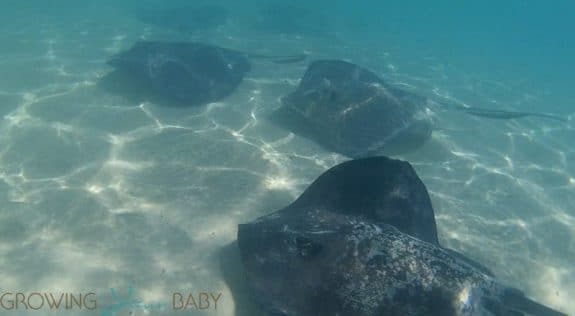 After getting to feed them, my husband and son enjoyed swimming around observing how they glide through the ocean. Their size could make them a little intimidating, but really they are just like cats looking to rub up against you! This was an absolute highlight for both of my guys. They would do this every day if given the chance. 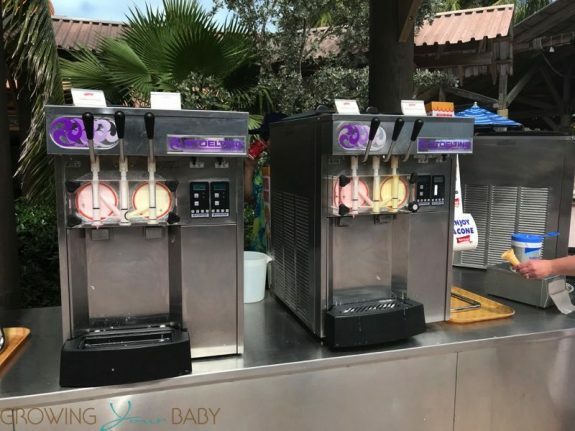 Yes, I can be easily plyed with copious amounts of ice cream and nothing makes me happier than 5 machines with different flavors all lined up at the ready. Like a 5 year old, I *may* have had 6 or 7 cones during my 5 hours on the island and it was bliss. After all you’re on vacation so eat the ice cream and sit back and do nothing! My husband spotted sea turtles in the snorkel section of the island which sent my crew into a frenzy and off on a swim to get closer. While out there they did get a chance to see them closer and also stumbled on some underwater structures out in the middle of the lagoon. If you’re looking to snorkel you can rent gear at the beach. It’s free if you have your own gear. Life vest are complimentary if you need them. There are also lifeguards stationed throughout the deeper sections of the water to ensure someone is close by if someone from your party gets in trouble. There were lots of cool fish to see under the water. The aforementioned sea turtles were harder to find once they got out there but my boys did spot a couple Mickey and Minnie statues which was a fun find. The ship’s crew prepares a hearty beach BBQ lunch for the passengers in a few restaurants on the island. Enjoy burgers, hotdogs, ribs, spicy chicken, with all the fixens and sides at Cookie’s BBQ and Cookie’s BBQ Two. They also have cookies, cakes, chips, and treats for dessert as well. Sooo much foooood! I won’t say I get out biking much at home but the views on Castaway Cay are enough to motivate me! 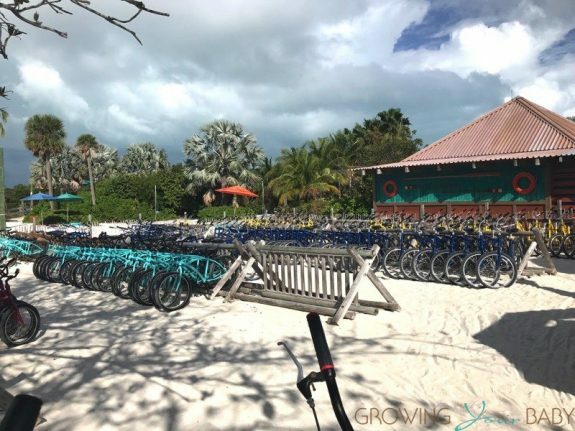 Bike Rentals are $12pp/hour for 3+ and vacationers can cruise around to get a better look at the island. You’re able to ride along the airstrip where you can turn off the road at one of 2 nature trails. If you’re looking for a better view of the island you can climb the observation tower to take it all in. Whether you’re traveling with a teen or a toddler, there is an area of the island perfect for them. Teens 14-17 can book the 4.5hour ‘Wild Side Teen Adventure’ where they’ll bike around the island before boarding a thrilling, high-speed ride boat to fly through the open waters. Back on land they’ll suit up to explore the ocean and then enjoy some time with their friends at the island’s Teen Hideout. Parents can cool their little ones off at Spring A Leak – a splash pad adjacent to the bike rental depot. Here kids can run through the sprinklers and play in the puddles. Best of all this island offers relaxation around every corner with no added cost. No fighting to get a cab just to find out that the beach you’ve been dropped off at is tiny, remote and has no access to food or restrooms. We’ve been there on many islands and it’s not good. 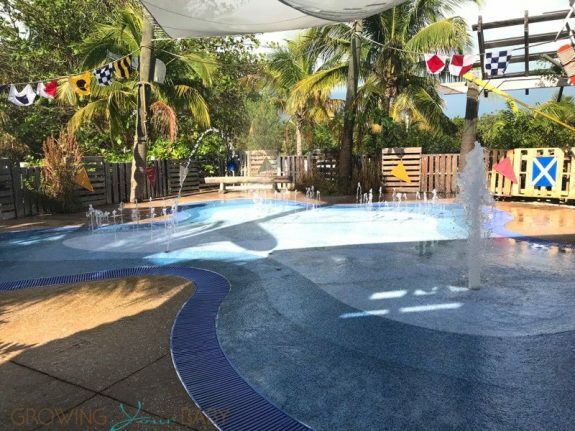 We love that Castaway Cay is safe, clean and designed to cater to families. If Disney built a resort on this beautiful island I would be first in line to stay for a full week! 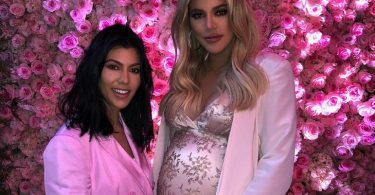 This looks like such a great family vacation with so many fun things to do! My kids would love those slides and I would love getting to see stingrays!